We offer only the highest-quality exterior doors from some of the industry’s most trusted names, such as ProVia. Among our vast collection, you’ll find doors in wood, steel, fiberglass, aluminum, and vinyl. Plus, all of our replacement door types are available in traditional or French-hinged styles. Sidelites – Choose from a number of configurations and sidelite styles. Hardware – Would you prefer a round or oval knob? Square knob? A lever? You can even specify the hardware’s finish, like brass, satin nickel, or rubbed bronze. Stained finish or paint – Whether you like the appearance of natural wood, a hand-glazed antique look, or even a sleek, painted finish, we can make it happen. Accessories – Want to give your door a rustic look? Consider adding a speakeasy, hinge straps, and clavos. Or, perhaps you have a furry family member that would benefit from a pet door. Glass – All kinds of glass options are available, such as privacy glass styles, internal blinds, decorative grids, and hand-stained art glass. Even more important than our products is our precision installation service. We use our own team of skilled, factory-trained installers who specialize in exterior door installation. That way, you can rest easy knowing that your new exterior doors are sure to stand the test of time. 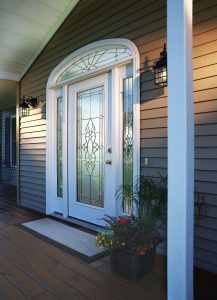 Ready to find new exterior doors for your home? Contact Windows Plus today, or drop by our Louisville showroom to get started.